For tonight’s second challenge we are cruising back in time! This challenge is to make a card with a VINTAGE theme. So dig out all of your retro, vintage and victorian looking supplies and create a vintage card to share with everyone here. 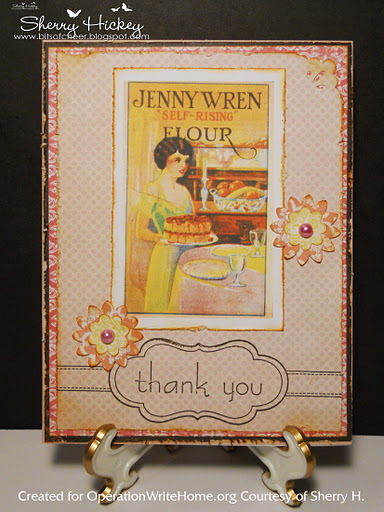 Our beautiful sample card for this challenge was created by Sherry H. The image is from Clearly Vintage and you can get complete details on this card over at Sherry’s blog. Thanks for the inspiration Sherry! Enter your name, URL and email address in the link below then press next step and select the photo of your creative project. An icon will appear on the blog featuring the photo you selected. If the photo doesn’t appear right away, don’t worry, it will after the page has been refreshed. Everyone who participates in this challenge will be included in a random drawing for the candy pictured here. The drawings for all the VCMP Challenges will take place on Sunday night and winners will be announced on the VCMP Master Post at the top of the S&S Blog. Sherry H is the perfect choice for vintage sample. Sherry, your card is cute as the dickens!